Colleen Parker began painting in 2008 by taking a series of beginning oil painting classes. She says she has been amazed by the generosity of the local artists in North and South Carolina. Her experience as an artist has been inspiring, humbling and totally engrossing. Parker is drawn to subjects that elicit an emotion, particularly the beauty of local landscapes. She considers her art to be visual diary that she hopes others will enjoy. 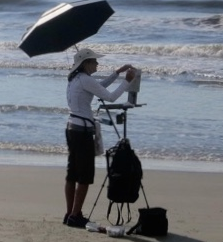 Parker's most recent focus is on plein air painting in order to really see life without a camera. She has stated, "It is the journey that excites me the most".